It feels important to sometimes just share my art with you. 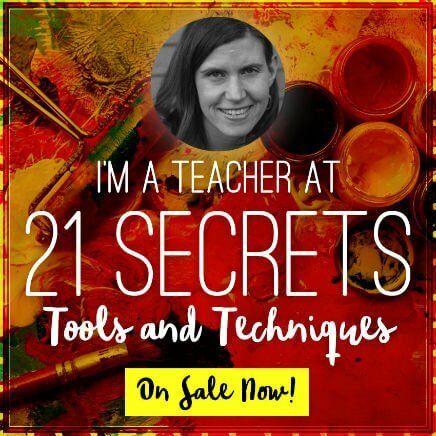 My hope is that you will find art journaling inspiration in seeing another artist’s work. Perhaps you’ll try new techniques or materials. Just looking at some of the blogs of my favorite artists is important food for my artistic soul. I created this piece with no brushes. 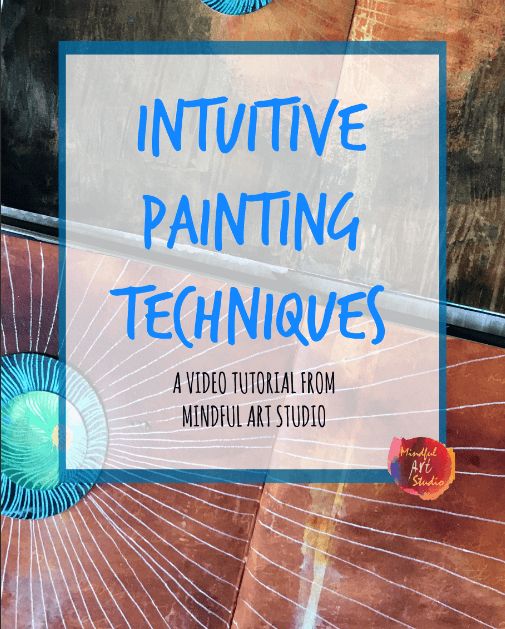 Yup – finger painting! I hope I can inspire you to try out using your materials in some new and playful ways too. You’ll be amazed at what you can do if you let go of some of the expectations of “good art” and just allow yourself permission to play. The circles are all in white gel pen* and black Faber Castell Pitt pen. * The black pitt was previously drawn on the page and I mostly covered it to integrate it into this piece. 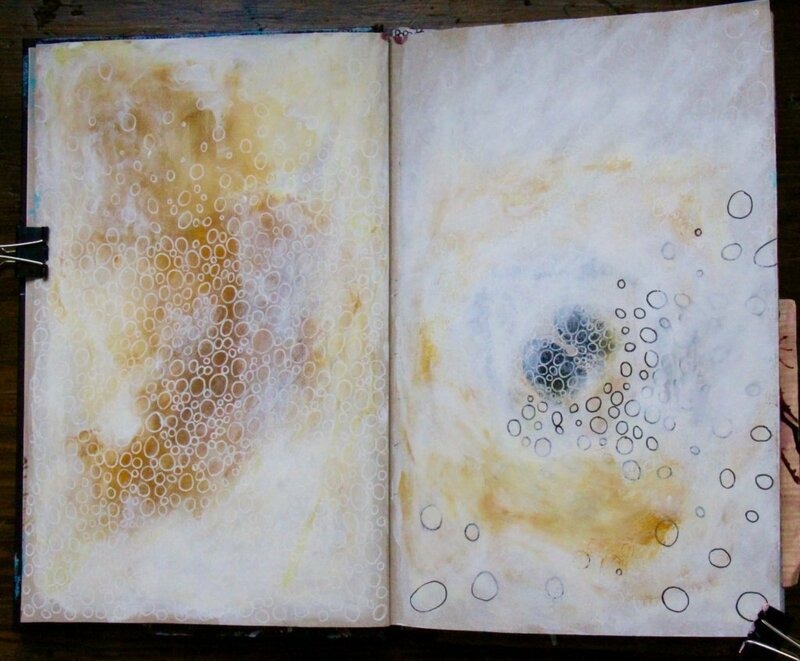 This spread is in one of my Strathmore tan paged journals,* which I LOVE. Come on, spend some time smearing some paint. Choose 1 – 2 similar colors plus white, and see what emerges. Don’t be afraid to work in layers until you are pleased. Remember to stand back frequently so that you can truly see your piece. This helps me a lot. 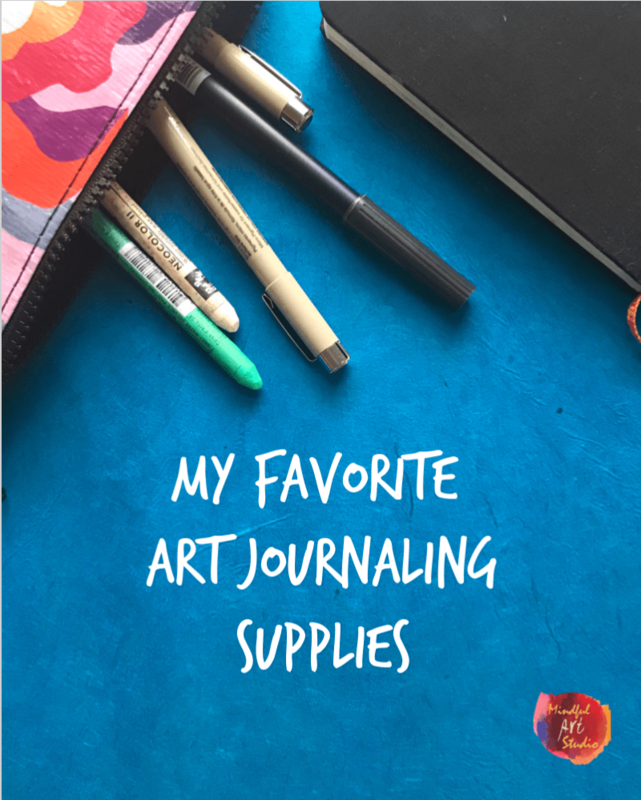 The last thing I want to tell you is that this art journal spread is also a part of a very, very special surprise that I will be revealing next Wednesday. I can’t wait. 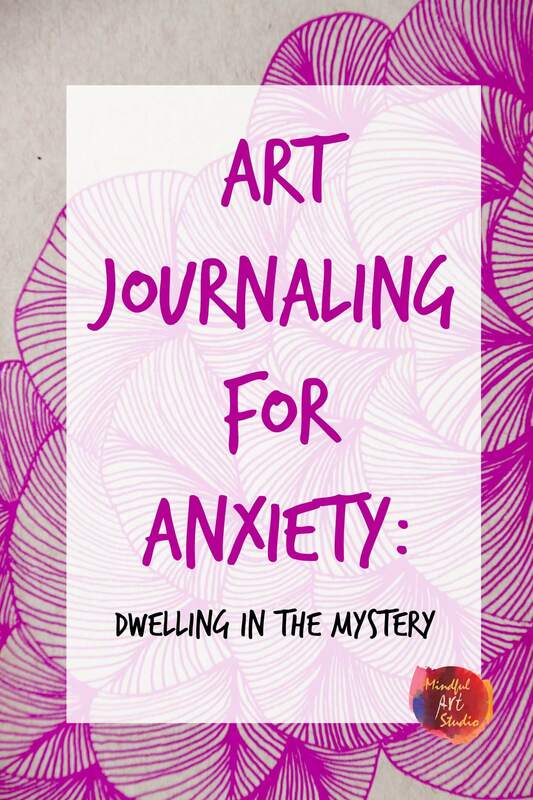 Until then, talk to me in the comments about your art journaling adventures, would you? 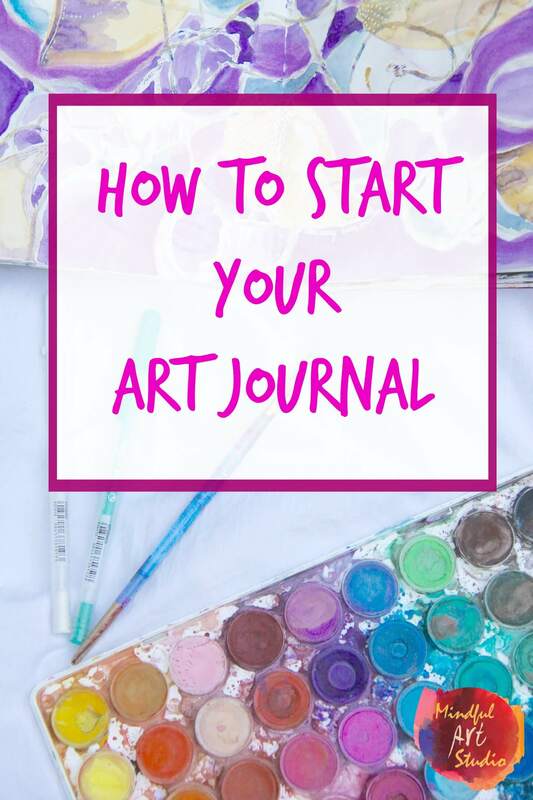 And if you are looking for more art journaling ideas, check out my art journaling tutorials page. *This is an affiliate link. 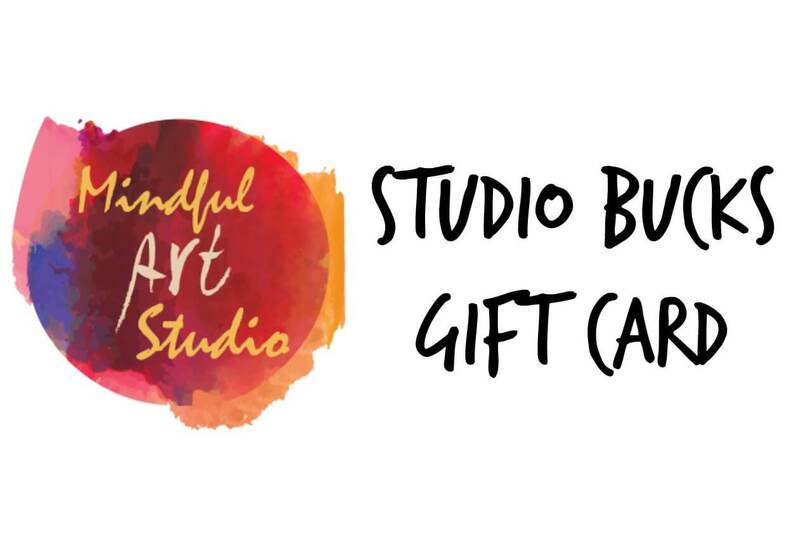 If you choose to click it and purchase something, at no extra cost to you I will receive a small commission that helps support the work I’m doing to promote creativity and artistic empowerment. Thank you! Thanksgiving is my favorite holiday. You don’t need to worry about gifts or extraneous obligations, and all the focus is all on family, food, and all the good things happening in your life. In the United States, it’s also the most widely celebrated holiday across cultures and religions, so it always makes me feel closer to EVERYONE I see that week – like we are all gathered in this one singular purpose of love, gratitude, and stuffing our faces. We should collectively do that more often! 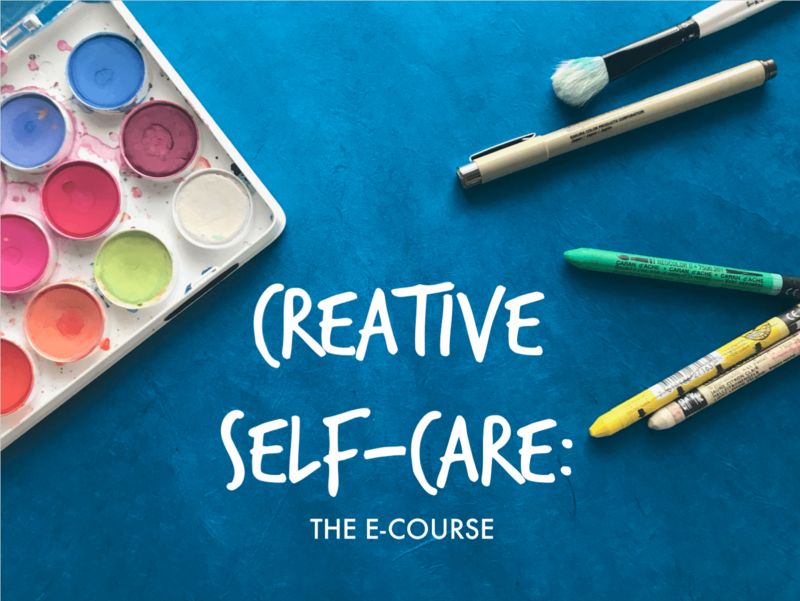 I was thinking, what would happen if you took a nudge from this wonderful holiday and got really focused on gratitude for the remainder of the year? 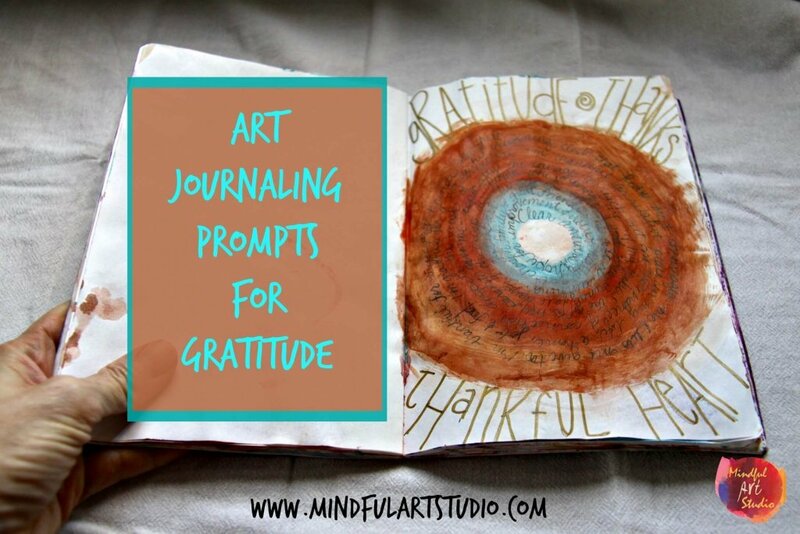 What if you did one journal page a week focused on gratitude? What if you did one a day? How would that impact your outlook? Your perspective? Your mood? 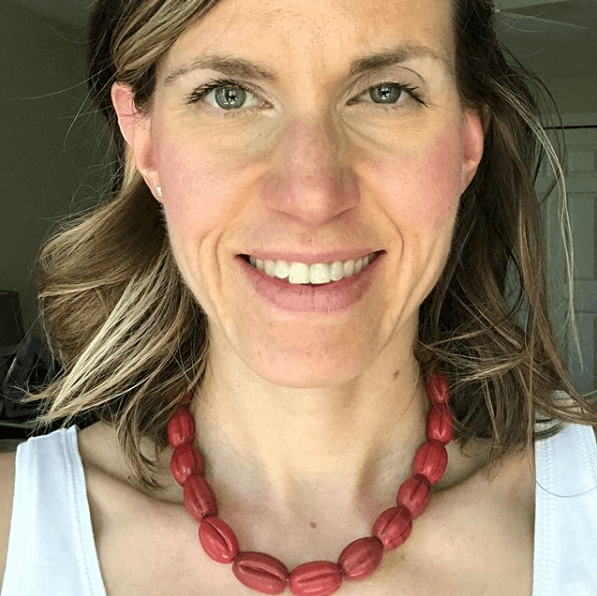 As noted in The Breathing Project’s video in my last post, there is a lot of research pointing to the fact that we find what we are looking for: if we look for the negatives, we will find them, and if we look for the positives, we’ll find them too. 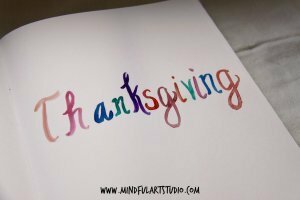 Shared Thanksgiving journal: Make several messy backgrounds as explained in this post, and use one page for each family member to record one thing for which they are most grateful. Pull it out every year and enjoy reading past years’ thanksgivings. Thanksgiving mandala: Draw a series of concentric circles and in each circle record a thanksgiving. 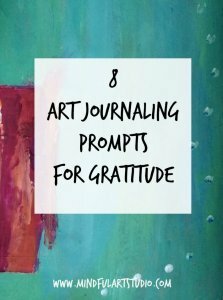 Gratitude topics: Journal or draw about a skill you possess, someone who made a difference in your life, a life-changing moment, or a hard-won, but valuable lesson. You might also make a list of your thanksgivings about friends, work, health, family, or the beautiful things in your environment. You can draw on the past or present, and simple or complicated things. Draw a symbol of gratitude: Draw a symbol that means peace, gratitude, growth, or change for you. 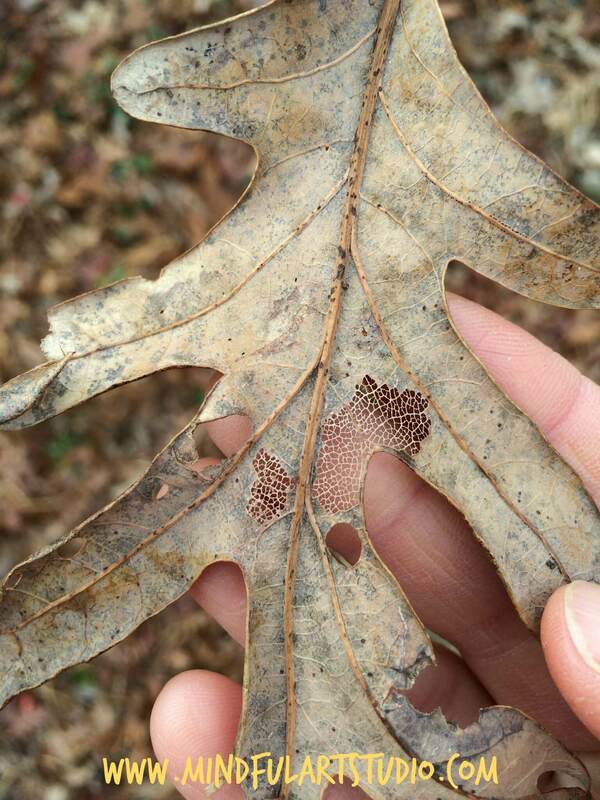 For example, draw a tree, and in each leaf, write a thanksgiving. Alternatively, you could write everywhere on the page except for on the tree. 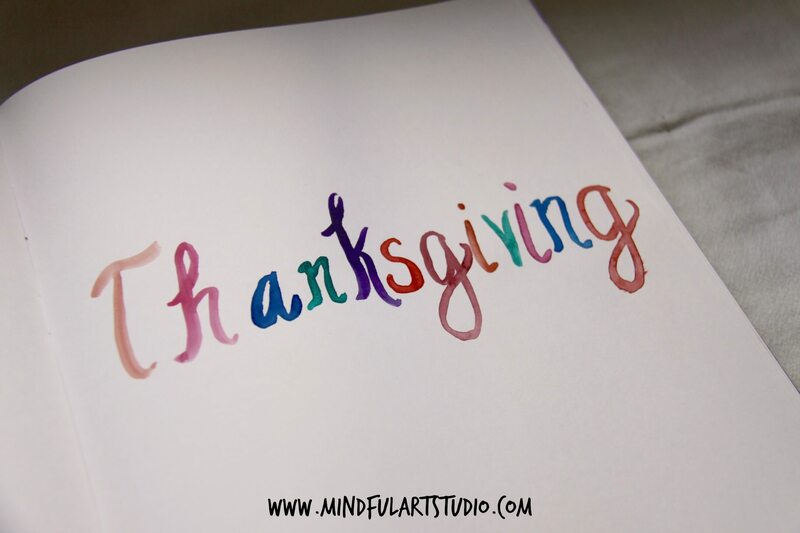 Gratitude writing: Smear acrylic paint randomly across your page. 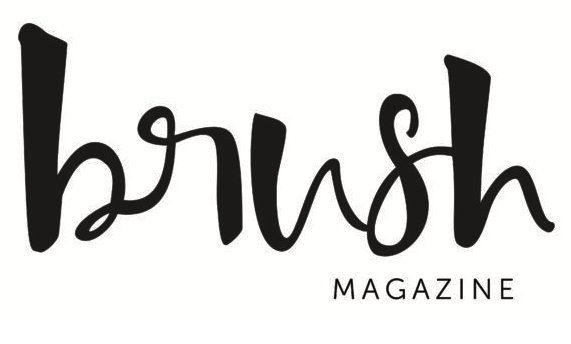 Wrap your text around this splotch so that it creates a random, interesting pattern. 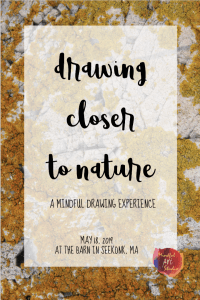 Draw something for which you are grateful: Even if you are not a skilled illustrator, let your mind focus on the object, photograph, or person, and let drawing be an act of dwelling with your feeling of gratitude. Make a gratitude grid: Use squiggly lines to create a loose grid on your page. Write your thanksgivings in a random pattern inside the boxes. Use watercolors to highlight the boxes in different colors. 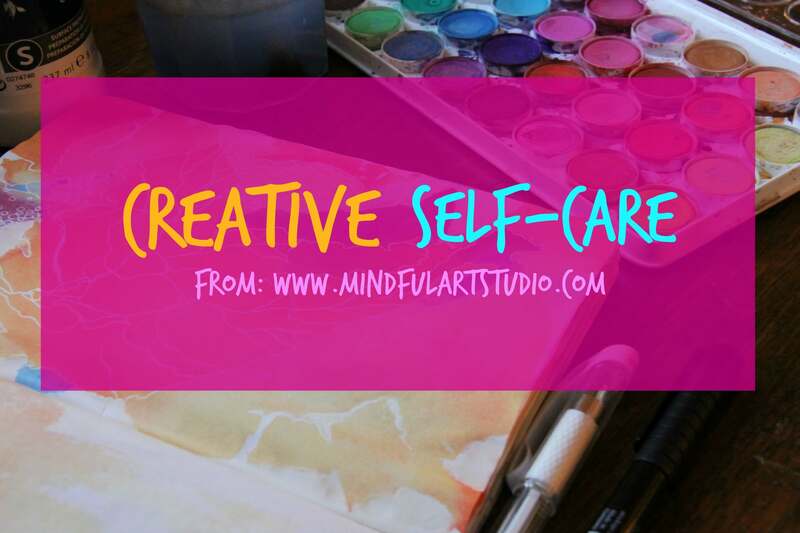 Art making as a gratitude meditation: Before you begin, create an intention for the art. Close your eyes, focus on your breathing, and slowly welcome in a bit more stillness. 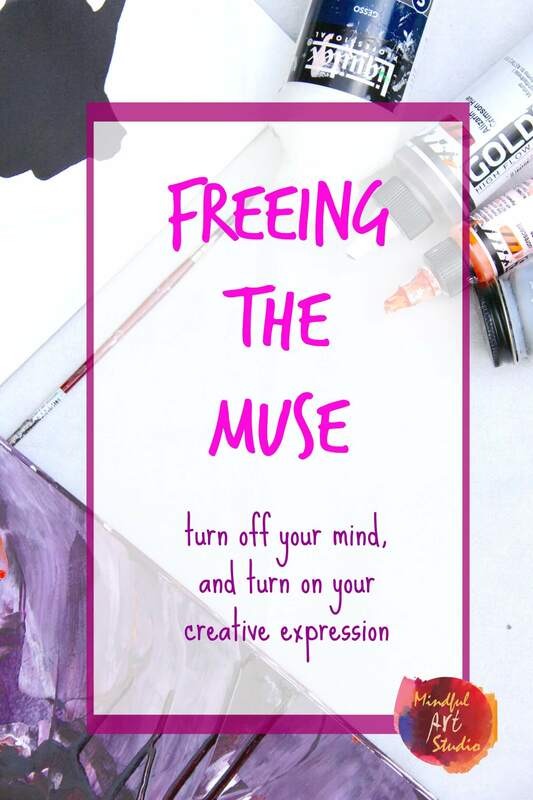 As you find yourself dwelling in a slightly quieter internal space, create an intention to use today’s art making as a way to meditate on your blessings generally, or to be mindful and present of the gift of making art today. And by the way, I’m thankful for you. As much as I’ve made it my job to inspire you, YOU inspire me just as much. Thanks so much for that. How are you showing your gratitude this Thanksgiving? Have you ever kept a gratitude journal? Would you share what the experience was like in the comments? Also, if you like what you see, please remember to pass it on by sharing on social media! 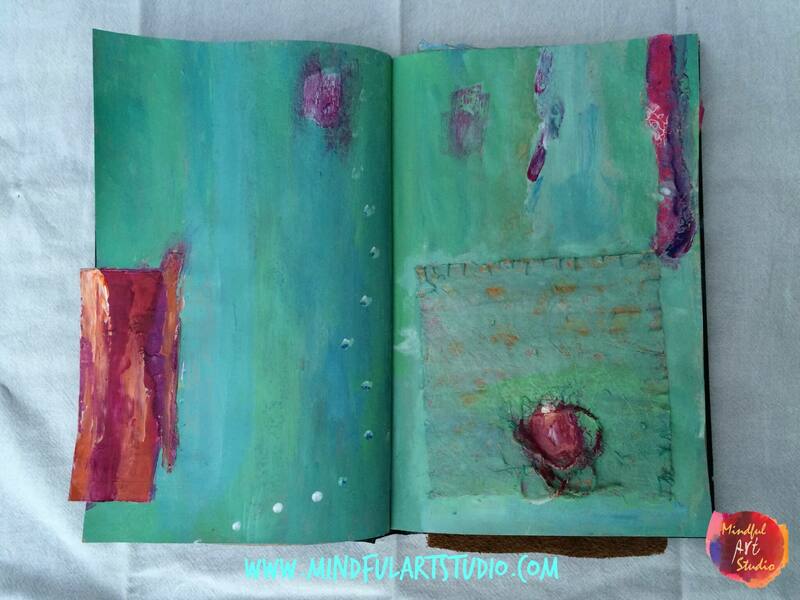 Handmade art journals inspire me. They offer so much creative control and choice. 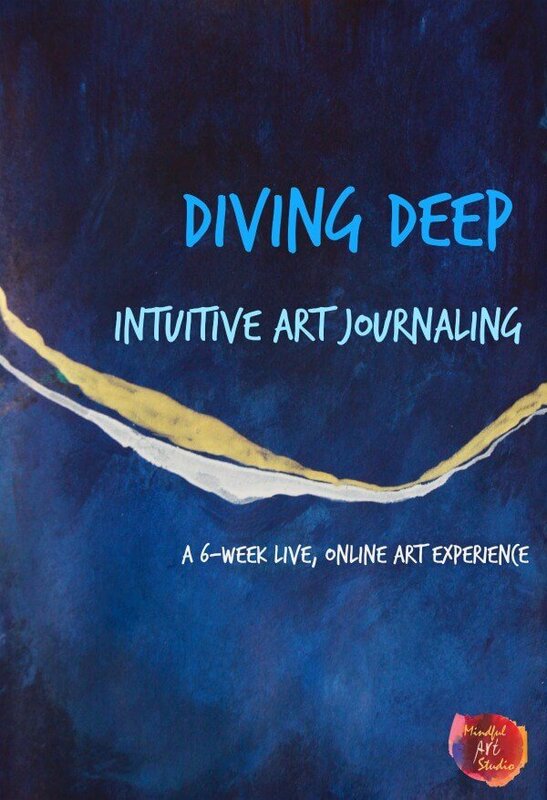 You can determine the shape, size, and density of your art journal, and whether, and how, it is bound. 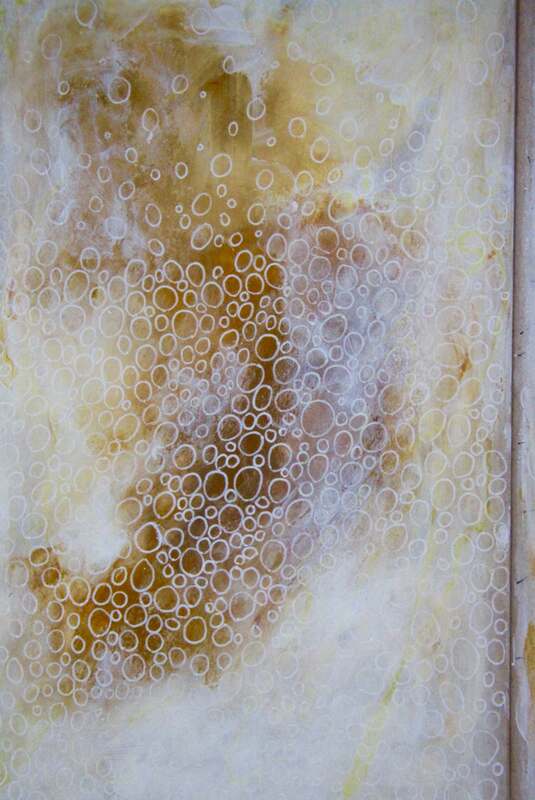 You may use traditional bookbinding methods, or recycle materials such as old books or your own art. I hope this post will inspire you to try a number of these techniques. Let’s start by looking at one of my favorite handmade journals. 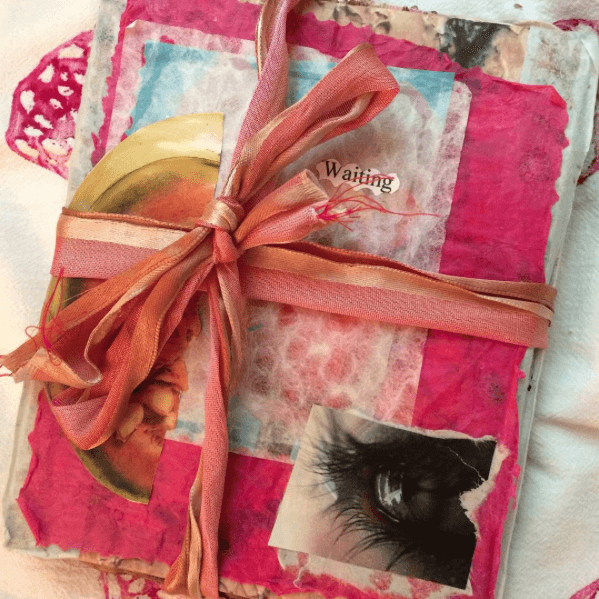 “Waiting” is a book I made many years ago, when I was waiting for someone who never really took the place in my life I was hoping for. (Does that sound familiar?) I love this book because with the combination of magazine cut outs, my own photos, special papers, and a few words, I really feel it captures my longing, misplaced hope, and disappointment. 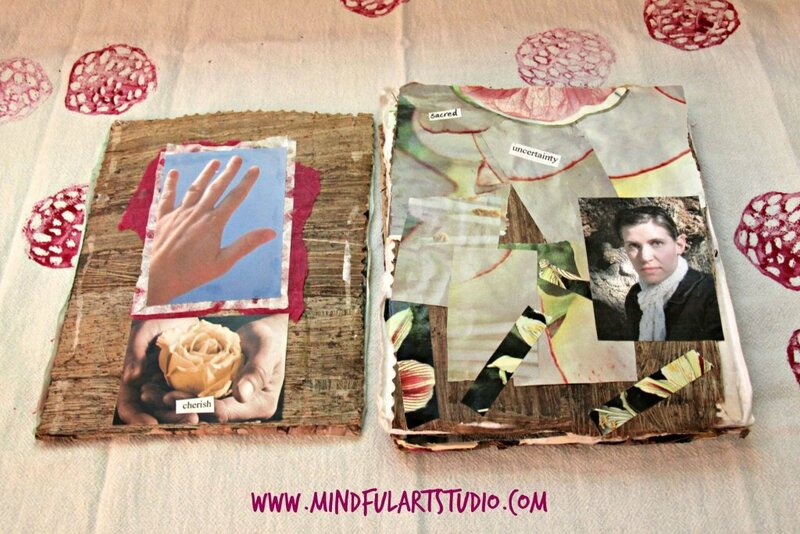 Handmade books and art journals are an amazing way to express your feelings. For the base of the pages, I cut rectangles from a cardboard shipping box. 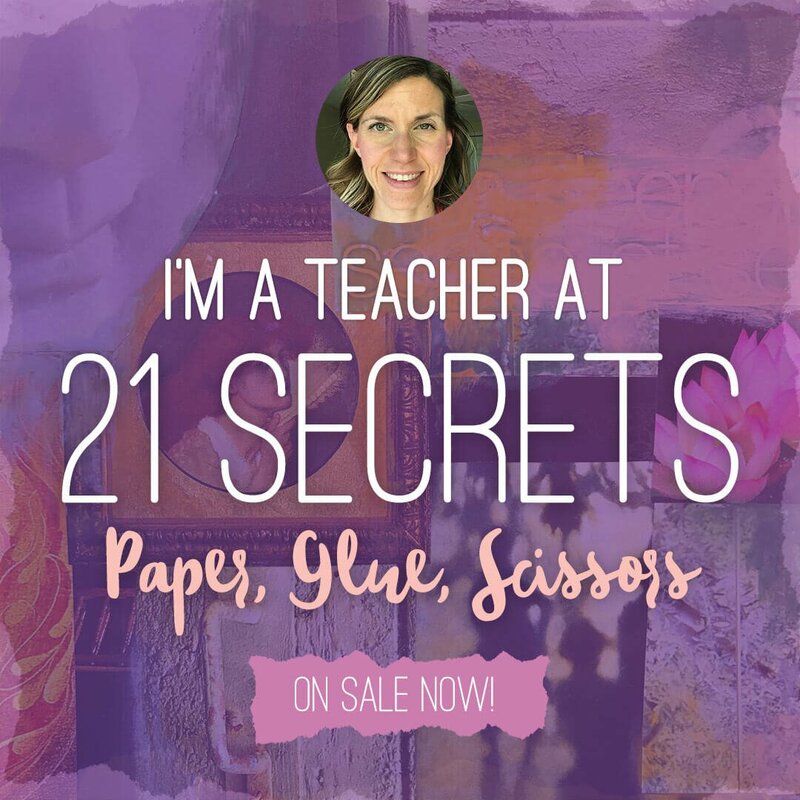 I then layered a variety of tissue papers, handmade papers, and a thin sheet of bark “paper” I found at the art store. It has an incredible smell, giving the book another sensory dimension. Its texture is rough and yet smooth, and I love how the images and the bark play so well together, both in theme and color. The other element that is special about this book is that I left it unbound. It’s a great metaphor for what happened (and didn’t) in the relationship. I like that the beautiful ribbon is what holds all the pages together. 1. Unbound Handmade Journal: An unbound journal, like the one pictured above, is unique. You can tie it with a ribbon or string, house it in a box, a shell, or any container. You can see beautiful examples of books contained in Altoids tins, seashells, and buttons (yes!) 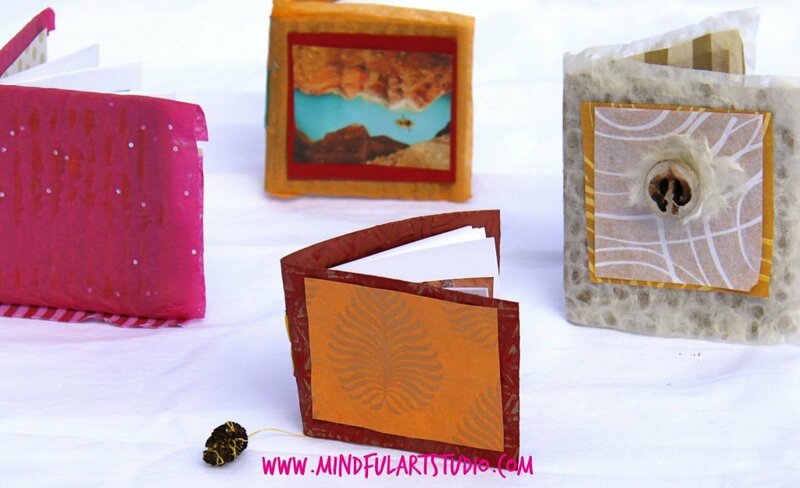 on my Pinterest board, Hand Made Books. 2. Booklet: For a simple paper bound book, here’s a nice little infographic on binding a booklet. 3. Lunch Bag Journal: Lunch bags and grocery bags are inexpensive (or free) and make a fun foundation for handmade journals. My lunch bag tutorial appears at the very bottom of the Art Tutorials page. 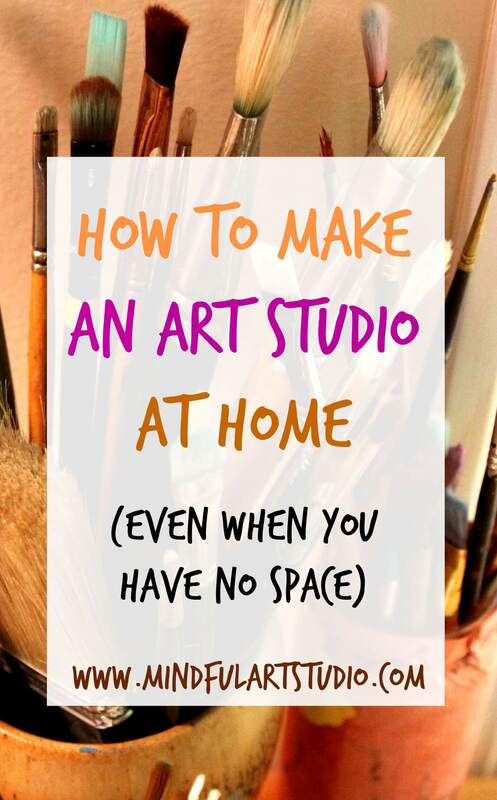 The House that Lars Built, a fun, artsy DIY blog has a 5 – minute tutorial on making a journal from computer paper and paper grocery bags. Judy Wise, a talented paper artist, takes the paper bag journal a step further by wetting and drying her pages, you’ll see the gorgeous transformation. You could do this too! What would you do with yours? 4. Coffee Sleeve Journal: Coffee sleeves are another wonderful candidate for repurposing cardboard. 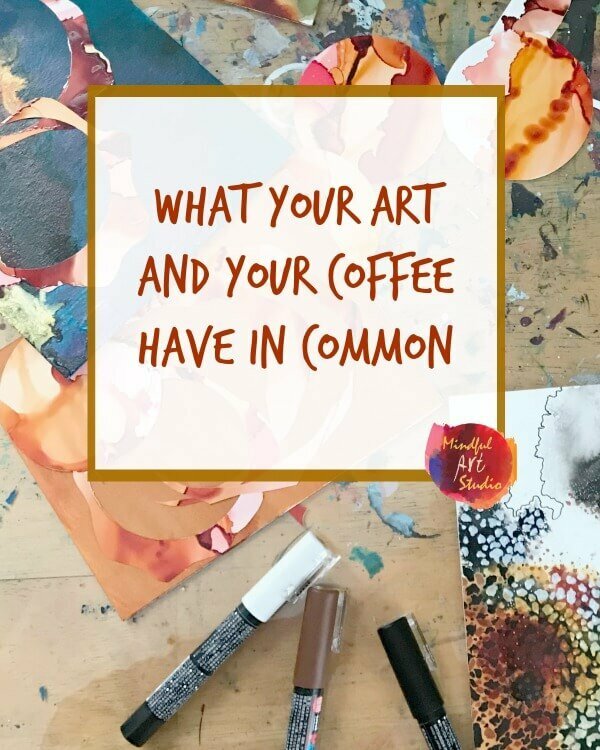 Check out this post I did on making mini-art journals with coffee sleeves and a single sheet of computer paper. 5. 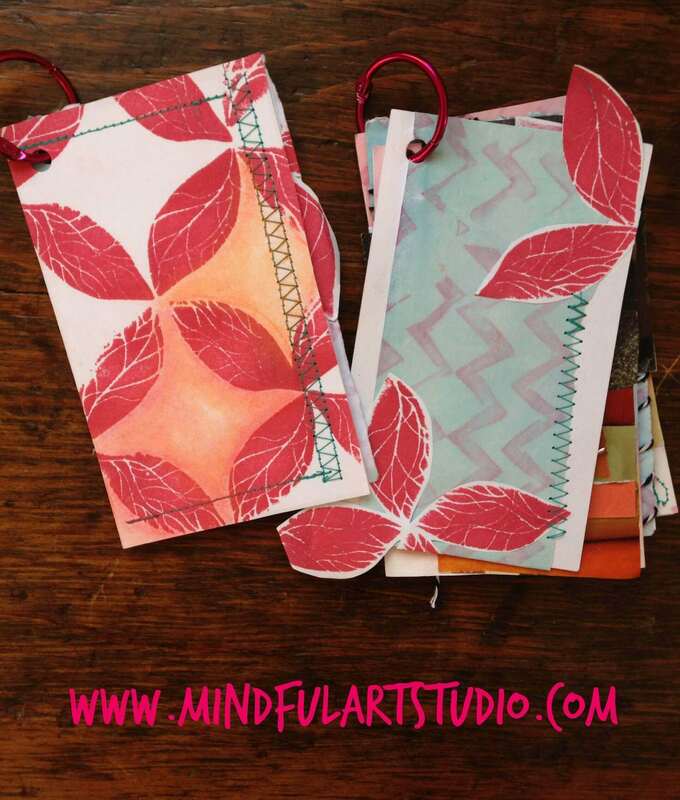 Index Card Journal: Another fun and very easy way to make a journal is using index cards. I show you how in this tutorial. 6. Accordion Journals: Accordion journals are a relatively simple form of handmade journal that you can make as complex as you wish. 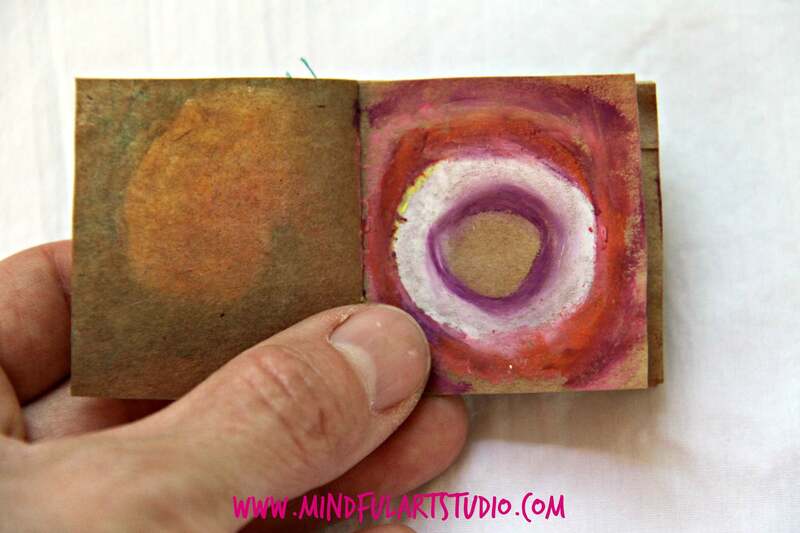 You can incorporate holes for a tunnel journal, or drop down doors, or pockets – the possibilities are endless! 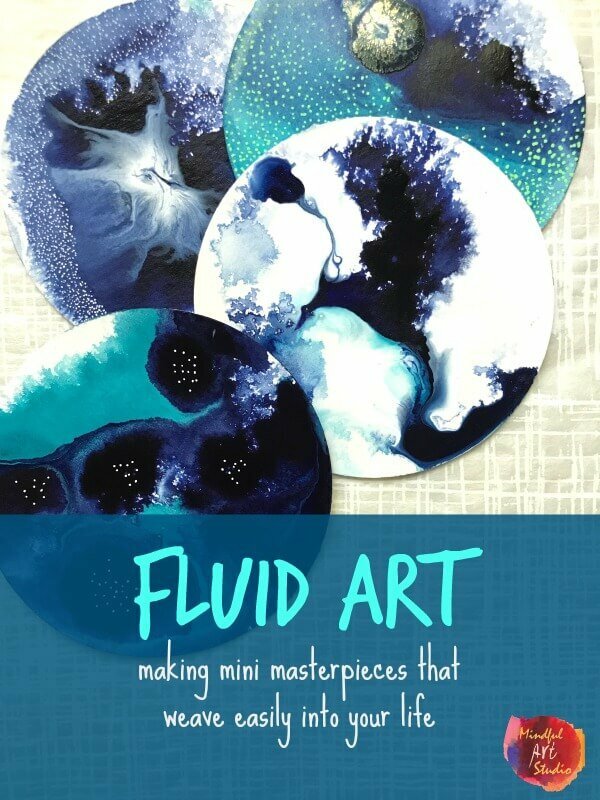 I teach how to make accordion journals and these gorgeous little paintings in my class, Fluid Art. Click here to learn more. 8. Custom, Hand Sewn Book with Signatures: To make a traditional, hard-bound book, James Darrow’s detailed and user- friendly tutorial on bookbinding is a must. 9. 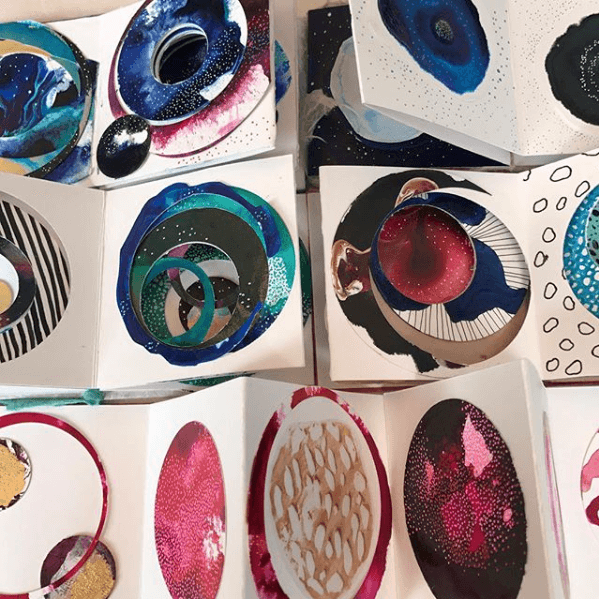 Hand Sewn Free Form Book: Watch this super inspiring video about New Zealand book artist, Liz Constable – you will LOVE her creations. 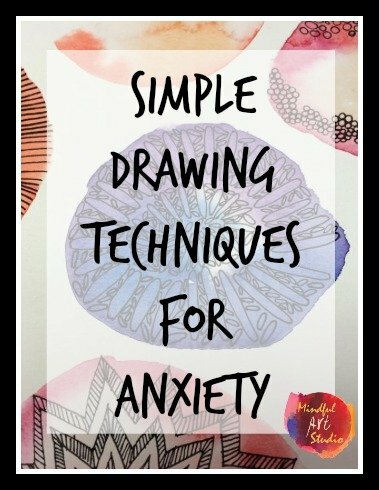 I got tons of ideas about techniques to try in my journal making. 10. 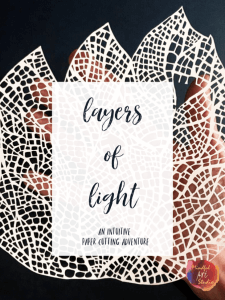 Journal Quilt: For folks who like fabric, thread, and sewing, you will want to soak in these “journal quilts” from The Dyers Hand. 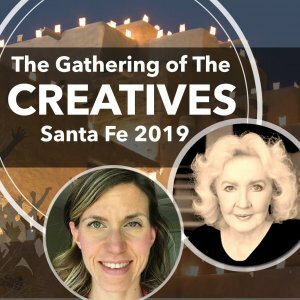 You’ll be moved by the art, but even more so when you read how these gorgeous pieces helped her heal from the death of her husband. 11. 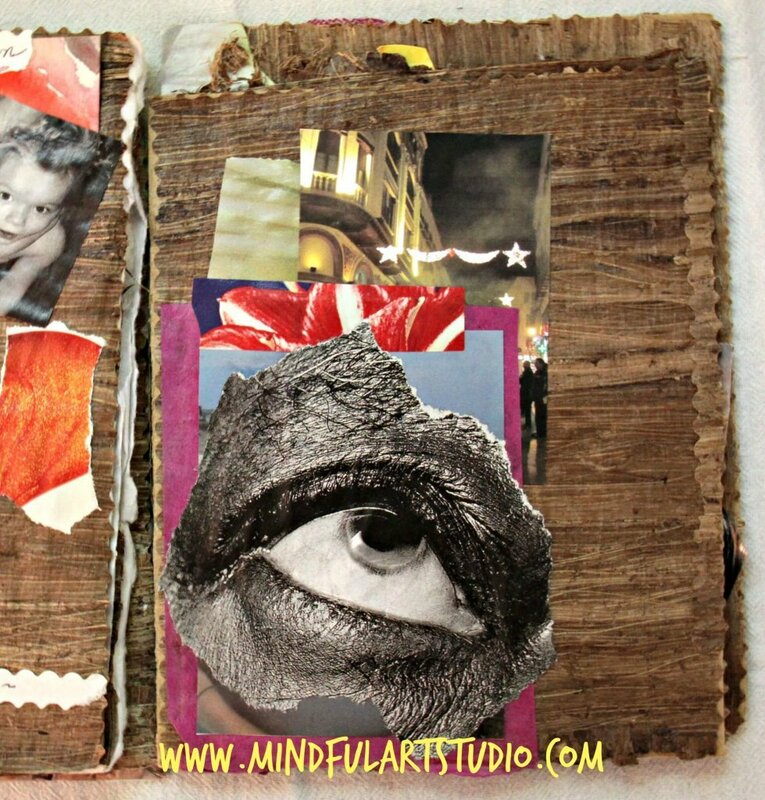 Junk Journal: “Junk journals” are a great way to use bits of old art pieces, beautiful papers, and magazine photo collages. This is a new handmade art journal, and I’m super excited about it because it brings together several pieces that never found a home. 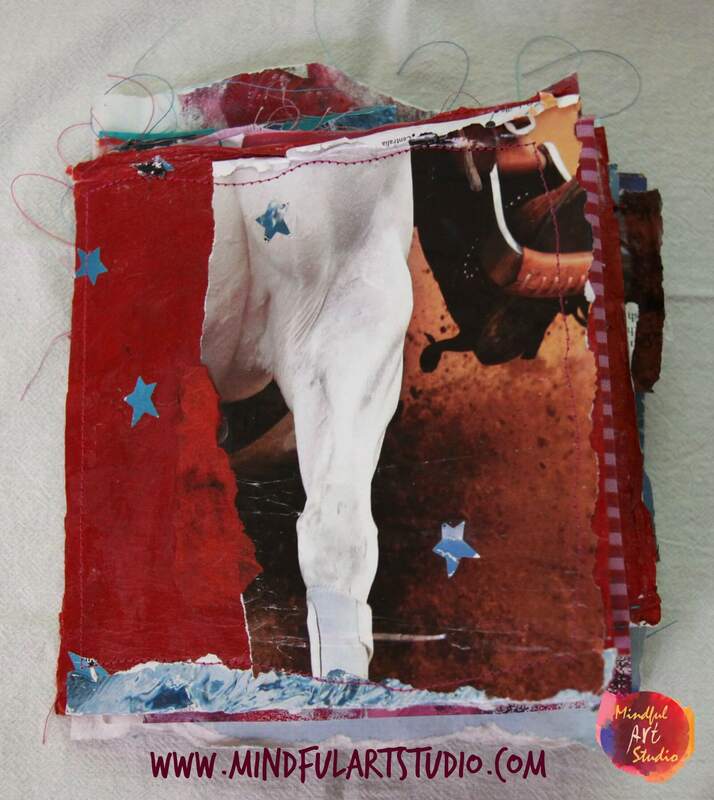 For this one, I used my sewing machine to stitch disparate bits of collage, paper, pretty cloth, and old drawings into “pages,” which I then sewed to the back cover of my book. I am rather obsessed with beautiful paper and fabric. Are you? I love when they are so high quality that it’s hard to tell which it is. For example, the gorgeous red paper featured on this journal cover looks almost like leather to me. 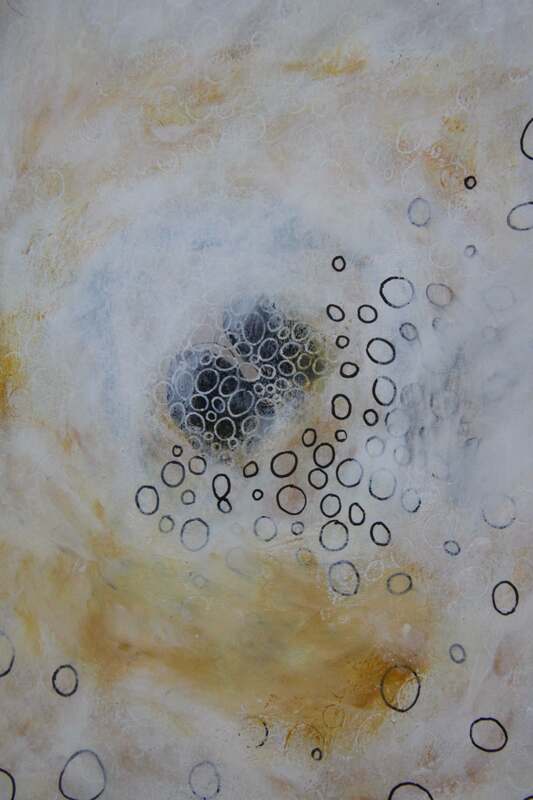 I think I had coated it with gel medium to harden it years ago when I first worked with the image. The Paper Source* or my local art store are where I usually indulge in handmade and high quality printed papers. Do you have a paper addiction? 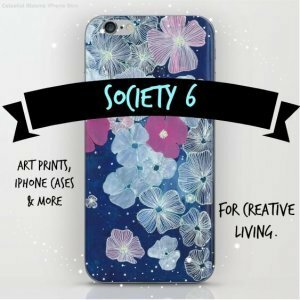 You can follow me on Pinterest for even more handmade art journal inspiration. 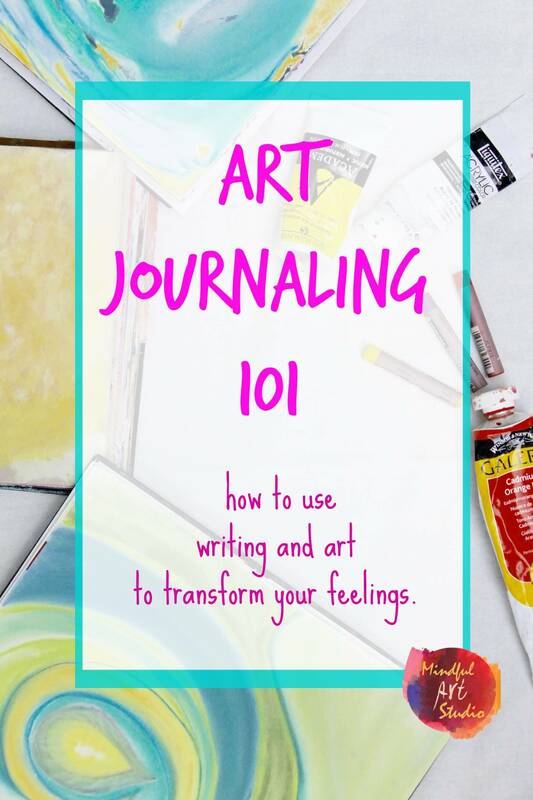 Of course if you are feeling more inspired by the idea of making the art than making the journals, you can buy a journal at your local art and craft store or online art store. 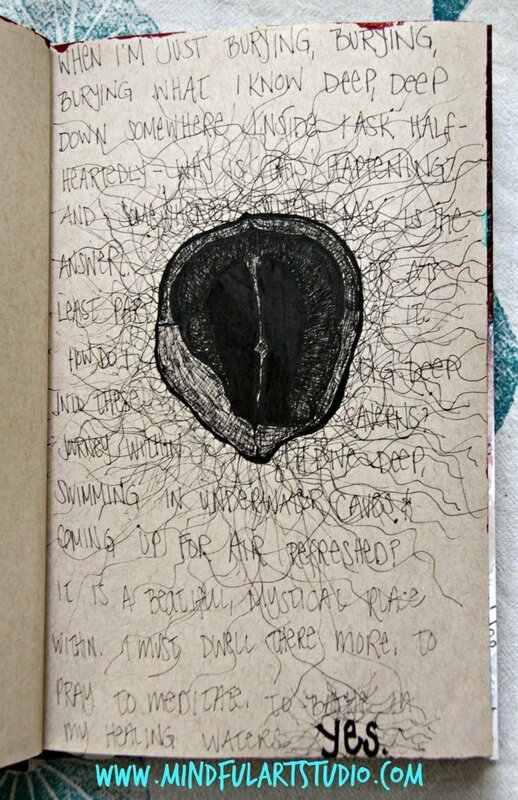 My current favorite journal is this one from Strathmore*. I love the tan pages – everything automatically feels more rich and “artsy” on them. 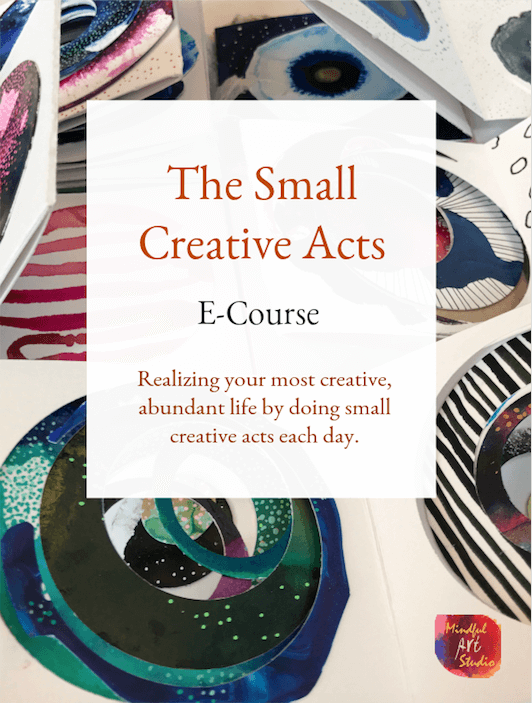 What are you in love with creatively right now? 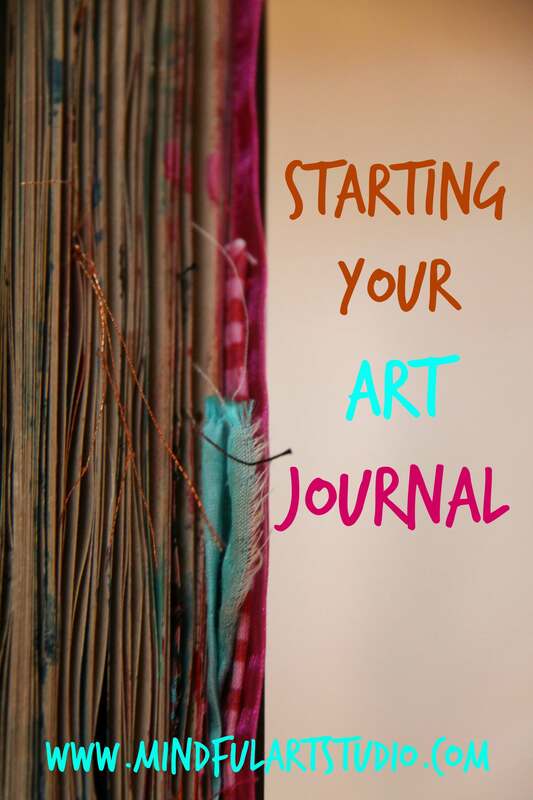 What are your favorite ways of putting handmade journals together? 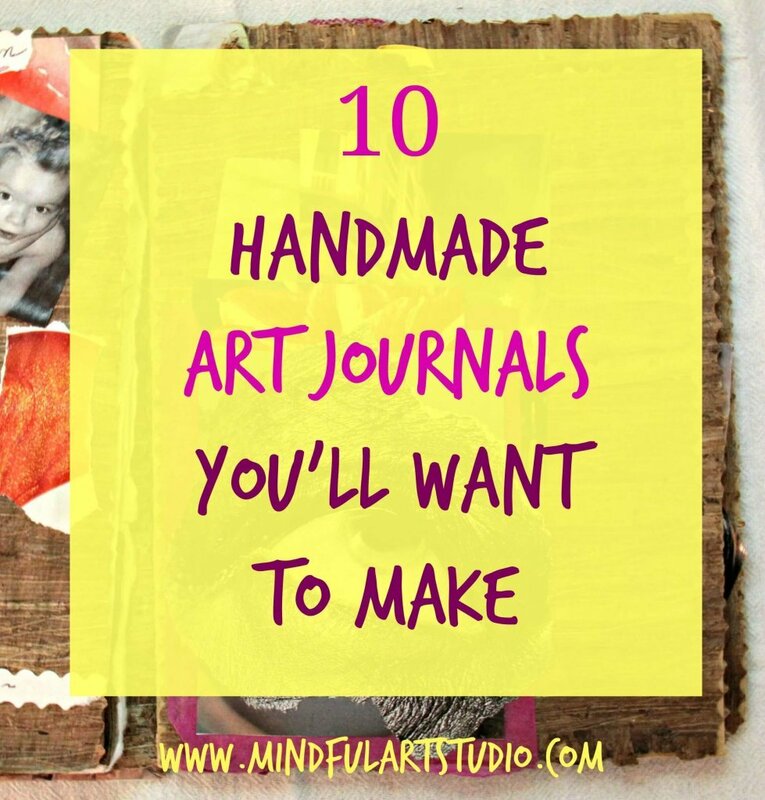 Have I missed any wonderful handmade art journal techniques that should be featured? Be sure to let me know in the comments. *Links with an with an asterisk (*) are affiliate links. If you choose to click and purchase something, I will receive a small commission, while you pay the same price. Please know that I only link things that I really love. Thank you for your support!